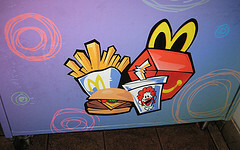 It was always a treat when we were allowed to get McDonald’s growing up, not only for the fast food burgers and fries but for the sugary soda that came with a Happy Meal. But McDonald’s is closing that chapter, it says, to start a new one, where it says it will only market milk, water and juice with the kids’ meals. Parents can still order a soda with their child’s meals — there won’t be a sugar bouncer glaring at them from the sidelines to whap anyone if they do — but Mickey D’s says in a press release that sodas won’t be advertised or promoted visually in any ads or on in-store materials either, it says in a new press release. The change was announced and made in partnership with The Alliance for a Healthy Generation (founded by the Clinton Foundation and the American Heart Association) and was announced yesterday by the president and CEO of McDonald’s, Don Thompson, and former U.S. President Bill Clinton in NYC. It’s part of a wider initiative that McDonald’s has committed to, with the goal of offering more balanced food and beverage options. Customers will also be able to ask for a side salad, fruit or vegetable instead of french fries in value meals.